This is the RFduino Dev Kit, a great duo of products in one box to help you get you started with and teach you the basics of RFduino. 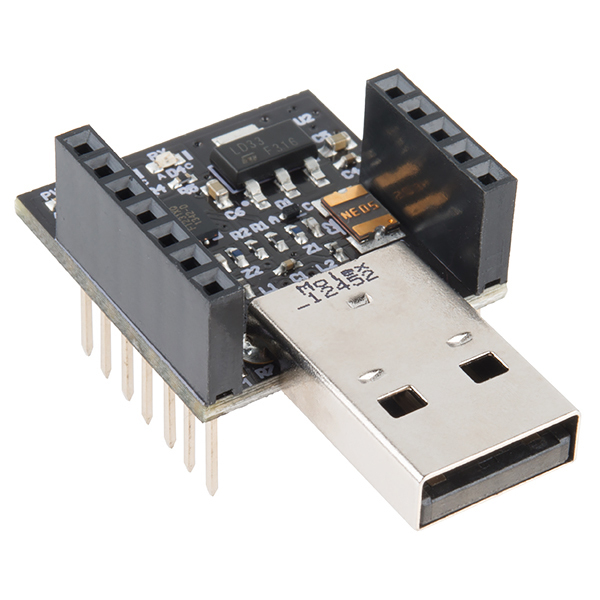 Inside this kit you will find two RFduino boards, the DIP mainboard and the USB shield. When attached, these two boards will be able to connect to the USB port on your computer and get your code through the Arduino IDE onto the RFduino DIP board. 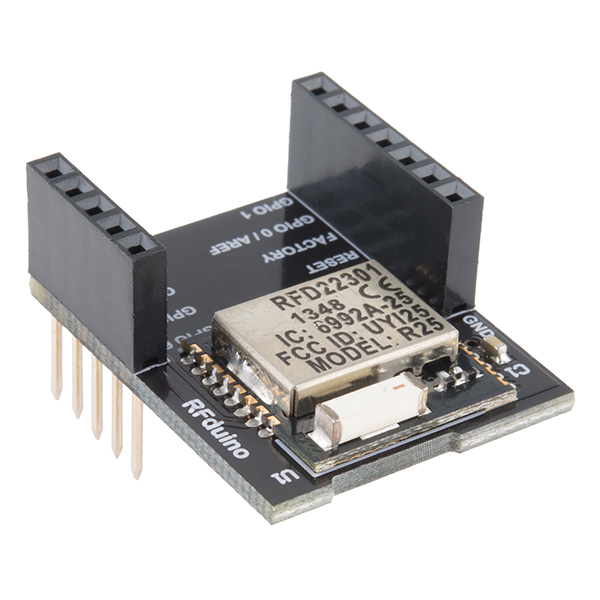 The RFduino is a Bluetooth 4.0 Low Energy BLE RF Module with Built-In ARM Cortex-M0 and RFD22301 SMT module for rapid development and prototyping projects. 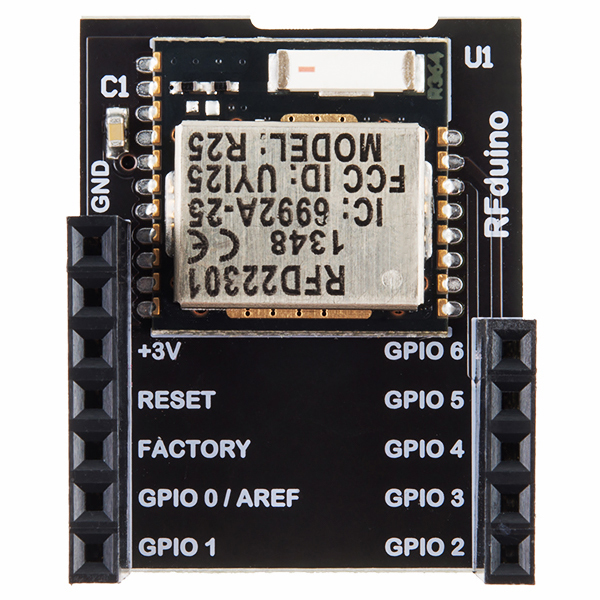 The RFduino operates at 3V and 18mA (4uA ULP), transmits of a 2.4 GHz band, and offers 128kb of flash memory with 8kb of ram. Via a Bluetooth connection with your iOS device you even run a series of free apps to control various shields through the RFduino DIP board. 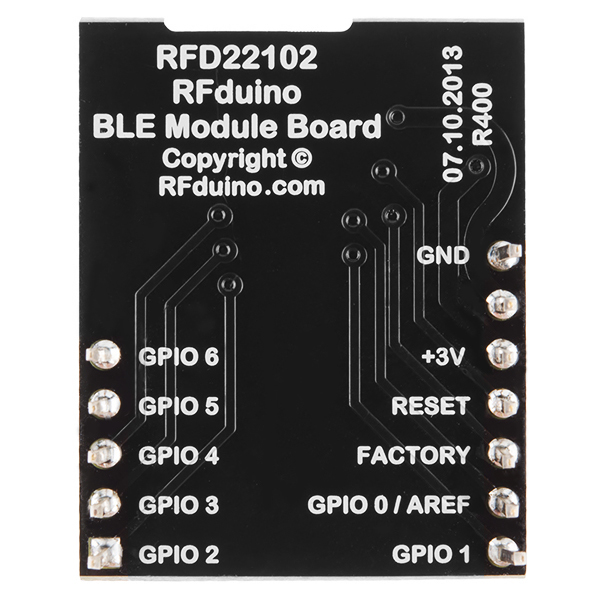 Meanwhile, on-board the RFduino USB Shield is a 3.3V regulator which can be used to supply power to the RFduino DIP module as well as other shields and possibly the rest of your circuit. 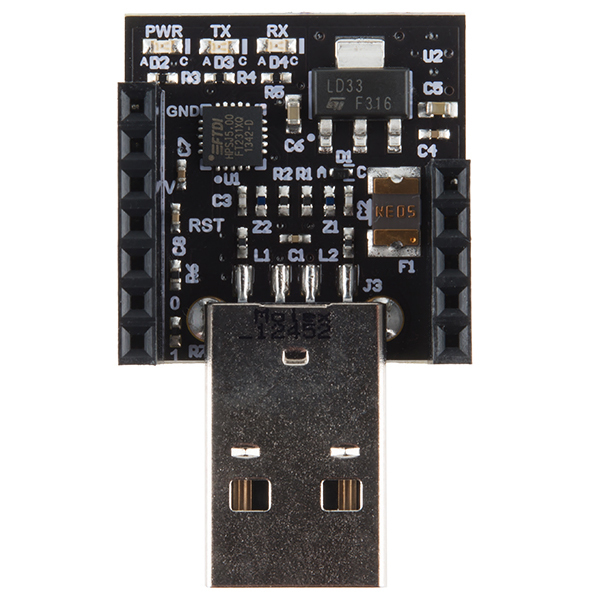 With this kit you won't need to worry about buying the USB shield separately from the RFduino DIP, it's all in one box and ready to be used right away! Is this an introductory price or will it be the price from now on? Also is there plans on carrying the rfd22301 chip on its own? That'd be the thing to get in bulk!!! "Via a Bluetooth connection with your iOS device"
So this device is compatible with Apple only, not Android? I have no use for closed, proprietary technology. It's compatible with Android, just not all android and that's not really their fault. If I recall, Android didn't support BLE before 4.3 and that's if the phone manufacturers added the hardware. I believe Samsung since the Galaxy 3 has had the hardware and several LG's. Of course, the Nexus 5 also. It's compatible with any BLE-capable device, but they've written apps for iOS (I imagine that there are also, or will be soon, apps for Android). In any case, if you roll your own app, you can make the magic happen on whatever device most pleases you, given it has the right hardware/firmware. Linux users beware: They still don't support linux (officially) - see https://github.com/RFduino/RFduino/issues/4. I was a backer of the original kickstarter campaign and am still very disappointed that they seem to just ignore the linux platform alltogether ;-(. It may answer some of Android issues. I don't own an Android device at this time, so it wouldn't help me. I do have a question, though. Are there a set of "standards" for such mundane tasks as conveying temperature sensor, time, humidity, atmospheric pressure, etc.? Where would I find it if it exists? 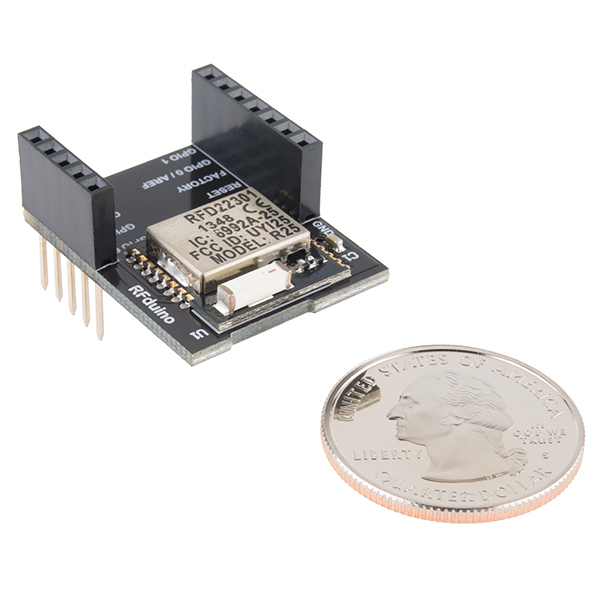 It strikes me as a waste of my time to create my own protocols, especially if I want compatibility between my sensors and existing software apps, or if I want to replace a prototype sensor with one I buy off-the-shelf? but i need ethernet, not BT, wireless ethernet please. 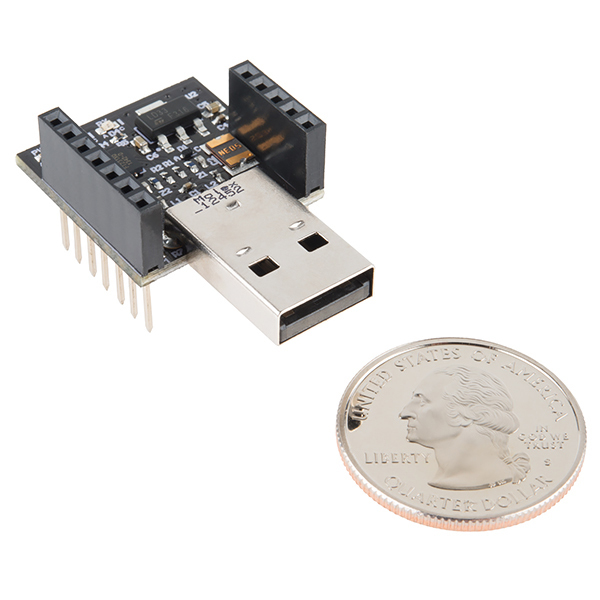 Take a look at the Tinyduino. They have WIFI, BT and BLE modules. The RFduino appears to be a (bulky) knock-off. Their web-site is dead, RFdigital web-site is also dead. Are they out of business? The RF Digital Site seems to be working, but with some issues. They are certainly still in business - maybe just having some web issues at the moment. Edit: You can find a lot of support files and docs on RFDigital's product page. You guys might consider stocking the RFD21813. I just ordered three from Mouser because I found out about them after reading this post. I would have much rather ordered them from SparkFun. 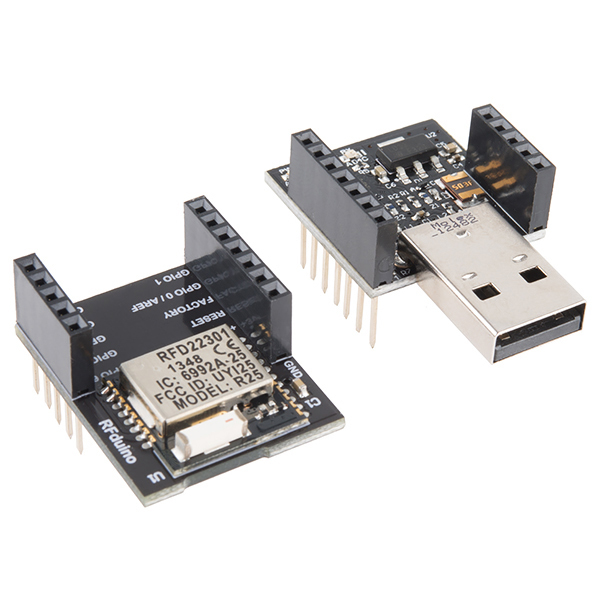 While lacking a few useful things, like a low power receiver mode, they look to be very useful modules for mess and many-to-one sensor nets where high speed data rates aren't needed. Can multiple devices be used in a peer-to-peer network? No replies yet? Building a multi-point network with this device should be of interest to many users. Any documentation available about this? I don't want to install wine just to program the RFduino. This is unexpected from the general *duino stuff which I have always found to 'just work'. Not a happy camper at the moment. If all you want to do is see if you can write a sketch for the RFduino then this Dev Kit will do it. However, if you want to see the RFduino do its thing then you need to add the RFduino - RGB/Button Shield. 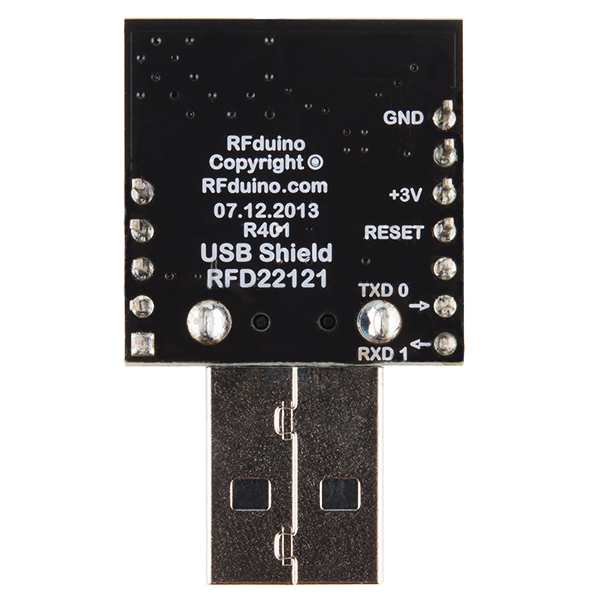 This additional shield will easily prove that the RFduino can indeed communicate using Bluetooth. If you want to save the cost of the Shield and you have the parts, you can build a breadboard equivalent of the Shield. Me, I'd rather save the time and trouble and buy the Shield with the Dev Kit. Of course I didn't know this at the time I bought the Dev Kit. so much to try, with such a small board! With a board so small with arduino and blue tooth... ...makes a great digital hot cold game! Hide a coupte rfduinos and put a password on the seek side. Add a few other clues and you have a scavenger hunt! Note to teensy users: with the latest beta version you can do both! Have three of the DIPs to run my Christmas lights strings and they have survived hanging under the eves of the house for a few weeks now here in the Denver area. What does not get well advertised beyond the BLE capabilities is the newer support for GZLL (Gazell network) which lets the DIPs chat with each other directly. You can get some reasonable distances with the radios getting close to 100 feet outdoors and 40 feet through the walls of the house. For more on the Christmas light use look up ToddFun.com . RFduino is not of the quality expected, lack of documentation does a mediocre product. I do not recommend purchase.